Houston Baptist University has engaged in the first stage of a long-term initiative to increase the University’s enrollment and to modernize and expand its campus facilities. The initiative, which was formalized in the campus master plan, includes the redevelopment of a commercial property along Southwest Freeway to create an innovative “university village” mixed-use development. The university village will be branded The Pillars at HBU – “The Pillars” for short. The Pillars is intended to provide a new amenity for the HBU community that will help support HBU’s enrollment growth objectives, generate additional income for HBU, and serve as a catalyst for other neighborhood redevelopment. The architectural style at The Pillars will match the campus standards to create a commercial center with a collegiate atmosphere that rebrands the campus edge and extends HBU’s visibility to the nearly 300,000 cars that use Southwest Freeway on a daily basis. The Pillars at HBU includes a new entry road connecting the campus to Southwest Freeway, an iconic entry tower, retail, office space, a hotel, enhanced parking, and an arena and event center. With leadership from Dr. Robert Sloan, Sandy Mooney, Sharon Saunders, Corky Dragoo, John Holmes, and Gary Dyke, among other campus administrators, The Pillars project has taken shape. Additionally, HBU hired Austinbased Brailsford & Dunlavey to provide third-party development advisor services to support the University on the implementation of the project. The HBU Board has authorized development at every phase, and as a result, The Pillars has successfully been launched and multiple phases of the project have been implemented. A generous gift included a generous gift from MaryAnn Belin and the Belin family helped HBU break ground at The Pillars, supporting both the connector road and Belin Tower. On August 25, Belin Tower was dedicated by President Robert B. Sloan, Jr. in front of an excited audience that included students, faculty, staff, administrators, Board members, HBU alumni, and community members. The dedication served as a tribute to Dr. Bruce Belin’s contribution to the growth of HBU and marked a launching point for the other commercial assets planned for The Pillars. HBU’s strategic initiative to extend the University’s brand to the edge of campus manifested itself in deliberate and detailed design requirements for the retail located within The Pillars. As stated by Dr. Sloan, “It was imperative that the retail located within The Pillars differentiated itself from other Houston retail centers. We wanted to ensure that the retail center represented the quality of the institution and the HBU brand, so design requirements were established to provide a sense of continuity with campus, elegance, and permanence.” Houston-based architect, PGAL, was engaged to create the design standards, which have been used on both Belin Tower and the retail buildings, and which will be carried forward as requirements for any future development at The Pillars. The retail will be opened in two phases, with the first phase of retail stores open for the 2016 fall semester and the second phase of retail stores open for the 2017 spring semester. HBU is currently negotiating with additional retail tenants to be included along Southwest Freeway for subsequent phases of development in the near future. The success of The Pillars and the recent growth of HBU has generated additional demand for an office building located at the campus edge. HBU met with multiple potential development partners to explore the opportunity for office development, and after successful meetings, HBU has engaged the DDM Texas Group, LLC as a partner for the development of an approximately 80,000 square foot, Class A office facility to be located within the development along Fondren Road. The office building will be subject to the same design requirements established in other parts of The Pillars development. HBU plans to lease a portion of the space to accommodate campus growth, but HBU and its partners are working collaboratively to attract office tenants that will supplement HBU’s space needs. The proximity of the campus to major Houston thoroughfares, the atmosphere generated by HBU, and the increased scale and quality of food and retail venues makes the office building highly desirable for prospective tenants. The project will remain in pre-development until a leasing threshold is met. HBU encourages people from the University community to reach out to Sandra Mooney at smooney@hbu.edu, or call her at 281-649-3202 if you have office space needs and would be interested in locating within The Pillars. The development of The Pillars has been steady, phased, and deliberate, and it will continue to grow into the future. HBU has started negotiations with a potential partner for a hotel development, retail opportunities continue to be explored and negotiated throughout the campus edge, and ultimately a new arena and event center will round out The Pillars. 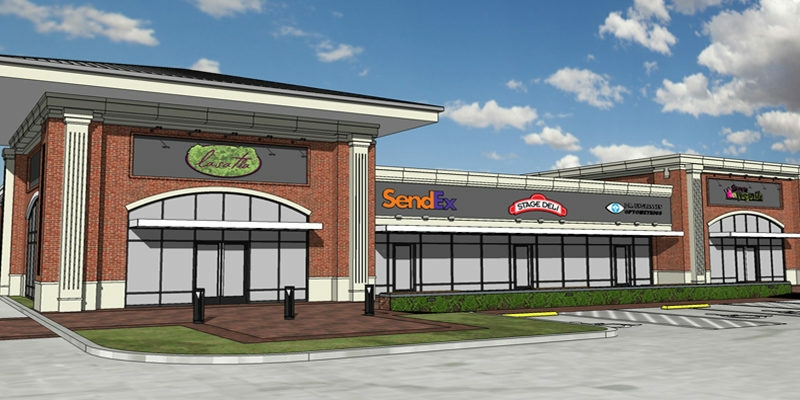 With the help of Houston-based retail partner Property Commerce, HBU has since signed retail leases with Salata, FedEx, Chipotle Mexican Grill, Sprint, Jimmy John’s, Shipley’s Donuts, Firehouse Subs, LifeWay, and Minuti Coffee.